A rowing dory is a simple, honest boat with enough building challenges for a novice without being over demanding. That’s why we chose the Phil Bolger designed Gloucester Light Dory (Type V) for our beginner’s course as it’s just about as straight forward as it gets. This model is a “double-ender”, and lacks the traditional dory “tombstone” transom, making construction even easier. Despite its vintage, it’s still a popular boat – no doubt in part due to its reputation for seaworthiness. Just the mention of “Gloucester Light Dory” caused many of our local “salts” eyes to sparkle in recognition. With five students, we set out to achieve what we could in six, three-hour sessions. Obviously we weren’t going to have a boat on the water at the end of it but with some volunteer input it should be ready for a spring launching. Victor, our most senior student, has been messing about in boats for years and has built a Bolger dory before. 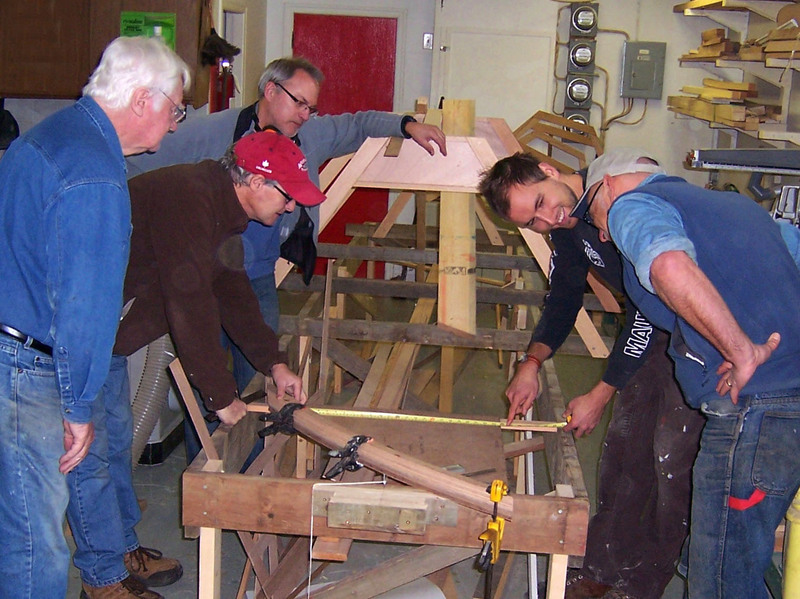 He is currently building a wee Bolger “”Elegant Punt” as a tender to his sailboat. The rest of the crew are novices – or at least they were when they started! I had a couple of weeks head start with the drawings and having built an Iain Oughtred designed Black Fish Dory some 25 years ago as my first boat, I had a good idea how it would go together. Tobias and Guy started cutting old boards down to size for the strong-back which was a project in itself. It was well done and we shall eventually dismantle it and keep it for the next one. Bob and Victor started lofting the frames onto a piece of surplus plywood and Brian and I lofted the stem and stern posts. There was a lot of head scratching over the first two sessions; reading drawings is a skill in itself but everyone quickly grasped the principles. The drawings are beautifully simple and at first sight it appeared improbable that every dimension needed would be there. Of course, from the drawing board of a veteran like Bolger, they were. One objective was to use Gorilla Glue as much as possible and defer to epoxy whenever we had gaps to fill. Gorilla Glue is very economical to use and because any excess glue that oozes out of the joint rapidly turns to foam, so cleaning up with a chisel or other sharp implement after it has cured is a piece of cake. The boat would be epoxy coated at the end of building to keep it watertight. We choose 6mm Mahogany marine plywood for the hull sides from our local Windsor Plywood outlet – a very nice 5 ply. To follow the plans and fit plywood seats, 3 sheets are required. We can get the bottom out of one sheet of 9mm ply. We found enough off-cuts of quarter sawn first-growth Douglas Fir in the basement to make up the frames and purchased a clear 20 ‘ X 4 X 1” Douglas Fir board from Windsor Plywood for the gunwales. We now have the frames in place and the hull-sides under construction. More details will be posted as the project progresses. Setting up the stem-post; left to right, Victor, Brian, Bob, Tobias and Guy.